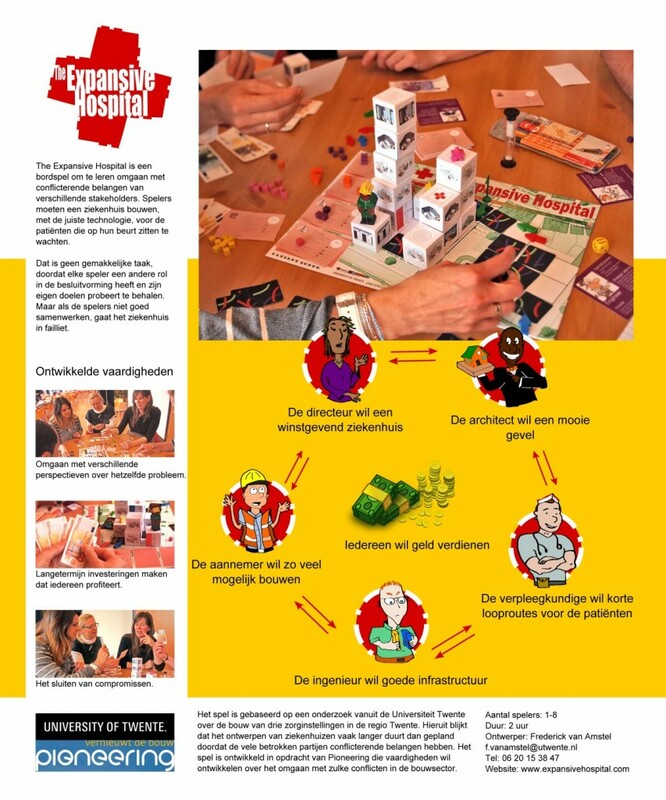 Poster presentation at medical technology conference | A board game about conflicts of interests in healthcare design. The Expansive Hospital was presented in the Symposium Patientveiligheid en Medische Technologie organized by The Competence Group. Representatives from many Dutch hospitals checked the poster and commented that the situation represented by the game is very realistic. They were particulary enticed by the possibility of playing a different role than in real life in order to understand a different perspective in a hospital construction project. Some suggestions were also given, for example, to include a role for the City Hall in the game. The presentation was assisted by Vincent van Loenen, a seasoned professional in the field who is helping getting in touch with hospitals who wants to play the game. Het is mogelijk het spel aan te passen, maar het ontwerp veranderen kost tijd. Het spel is een complex systeem waarin elke deel hangt vanaf andere deel. Als je middelen hebben voor de aanpassen dan schrijf ons een email.